When artist Joel Barr arrived in Atlanta in 1997, he established his studio in his Inman Park loft. Barr found the striking unnamed portrait on the left at a Clearwater, Fla. antique store. “He controls the room,” says Barr. 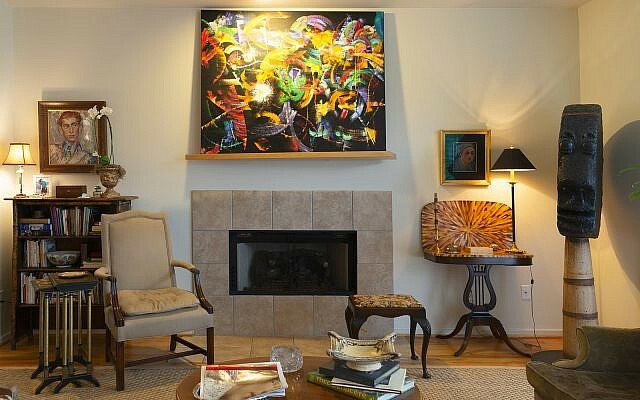 "Early Spring," a Barr abstract, is on the mantle. On the right stands The Ancestor, another Barr sculpture, which uses an old churn for its base. The life-sized Greeter, positioned on a bird cage ring, stands at the front entrance, using navigation arrows that are not to be trusted. 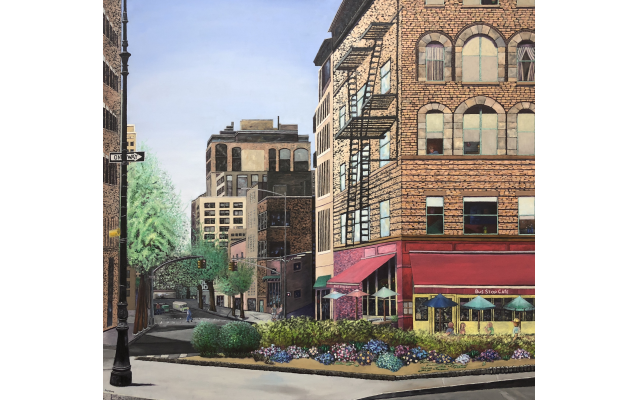 This large piece, “Greenwich Village Corner,” is a commissioned work that now hangs in a Birmingham home. “Sunshine State” captures bold sunlight on familiar elements of Barr’s home in Florida. 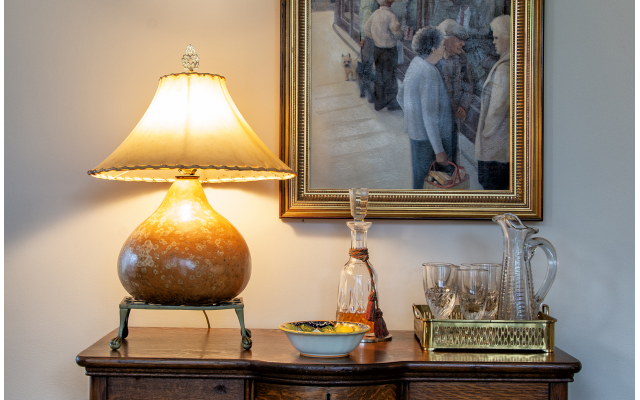 This gourd lamp and vintage glassware complement a favorite oil by Dale Kennington. 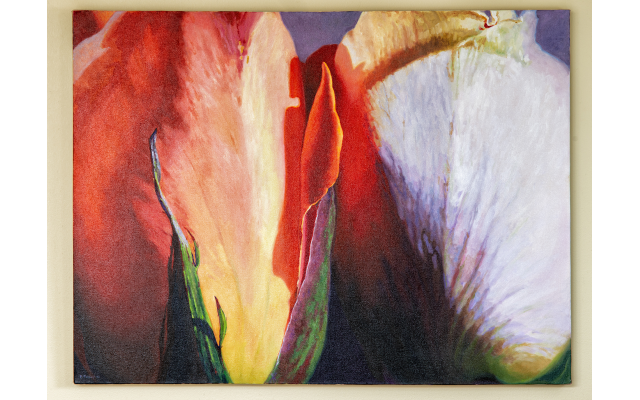 This untitled sensual floral painting was done by Barbara Tiffany, the Florida artist who encouraged Barr to begin painting and ran a workshop he took for three years. When artist Joel Barr arrived in Atlanta in 1997, he established his studio in his Inman Park loft. Since then, he’s had studios in Cabbagetown, at TULA Art Center in the Peachtree Battle area, and now in Chamblee. He arrived at his art-centered career after years as a teacher, writer, business owner and city planner. 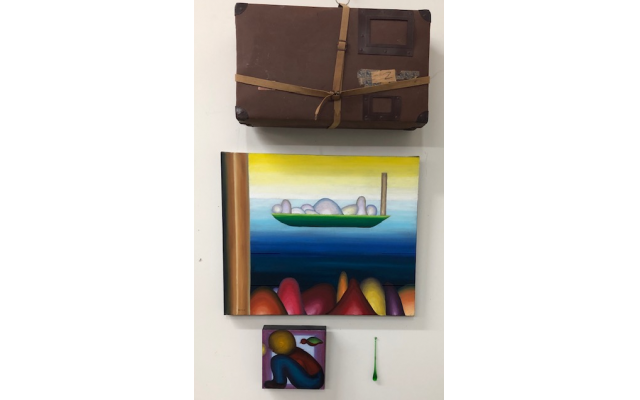 “I didn’t pick up a brush until I was 47,” he says, “but became a full-time painter at once and have been painting most days for the past 25 years.” He’s a grandfather now, living in Brookhaven with his wife, Grace Collins Barr, who is a writer, and their dog, Henr. 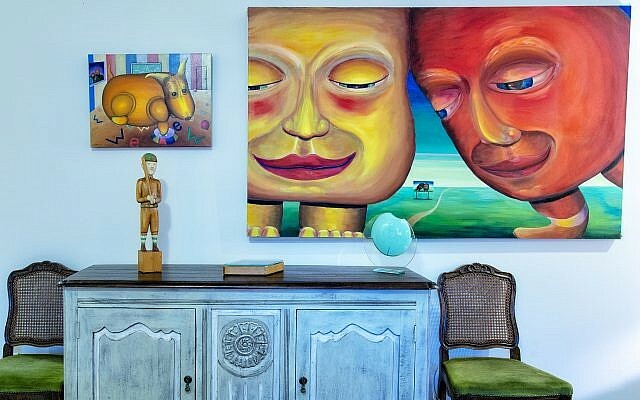 The striking and airy interior of his townhouse features Joel’s art and pieces by other artists he and Grace have collected and treasure. “Love in the Library” features Grace and their first dog, Jack. Jaffe: Would you describe your art practice? 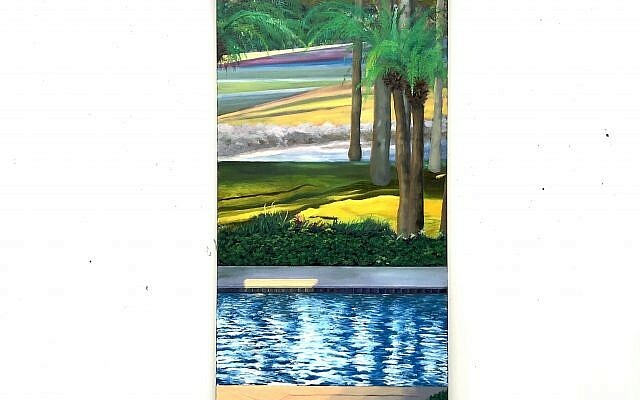 Barr: I’m primarily an oil painter and have been from the start. Oil paints surprise, challenge and amaze me. I’m struck by the idea that using them puts me on the same art highway that stretches back to the masters and forward to who knows what. Although I sometimes create sculpture, I always return to oil painting. Jaffe: I’m impressed by your versatility and number of styles. Barr: Yes, I do change often. For a while, I painted large, rounded figures and later moved to heavily textured palette knife work and more layering. In the end, I’m most interested in the narrative the painting offers so the style is in service to that. The painting should present a certain point in time with a fuller story to unfold before and after that point. My hope is that the viewer will participate in writing that story, with the painting and its emotion as a jumpstart. Jaffe: How do you start a painting? Barr: I’m enthralled by the blank canvas for the mystery it is about to reveal. Almost anything will initiate a painting, so I have a conversation with the canvas. It’s quite a personal and spiritual conversation for me. I might begin by putting a small red mark on it and then have to answer questions about it. What is it doing there? What happened before it got there and what happened next? 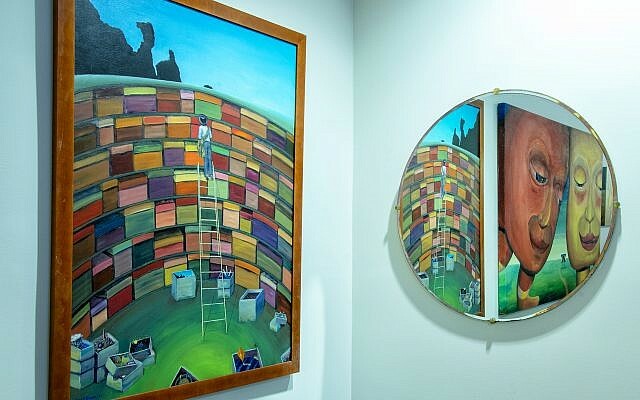 In that way, the painting will become a snapshot from a bigger narrative. Jaffe: You have a small home studio in addition to your space in Chamblee at the Urban Art Collective. Barr: The home studio is for those times when I feel the need to paint immediately to keep a painting thought from disappearing. I also like to do a small piece in the morning, a morning meditation. The small studio is perfect for these activities. The Chamblee studio is larger, with higher ceilings. There I can concentrate on larger works and even large sculptures. I also get to feed off the energy of over 20 other artists who are working around me in the same wonderful building. I have the room to create works like a triptych composed of three panels totaling 10 feet wide by 5 feet high. 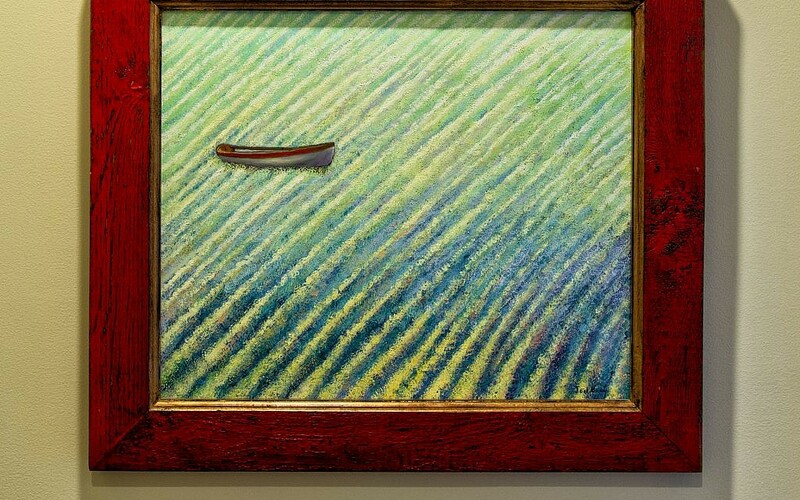 “Safe and Adrift” is a Barr oil painting whose title suggests eternal hope. Jaffe: Who are some of you favorite artists? Barr: I love Paul Klee’s work. It’s always fresh, playful but serious at the same time and so full of color. Miro is also a favorite. 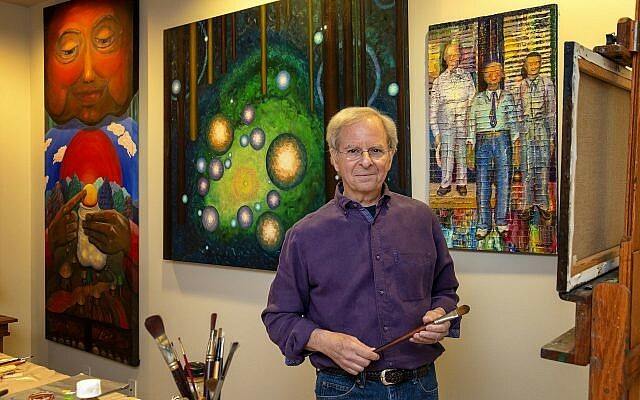 We were lucky enough to be friends with Dale Kennington, a premier American painter. She was a Dothan, Ala., artist who was a mentor to me. We have one of her earlier pieces in our dining room. Jaffe: Share the sentiment of the special wall in your studio on which your father’s suitcase hangs. 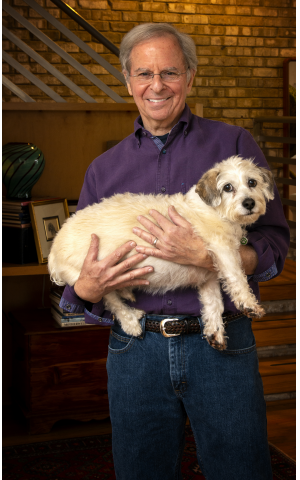 Joel Barr holds Henry Barr, a rescued Bichon mix. Jaffe: Your sculptures are massive yet light. How do you construct them? 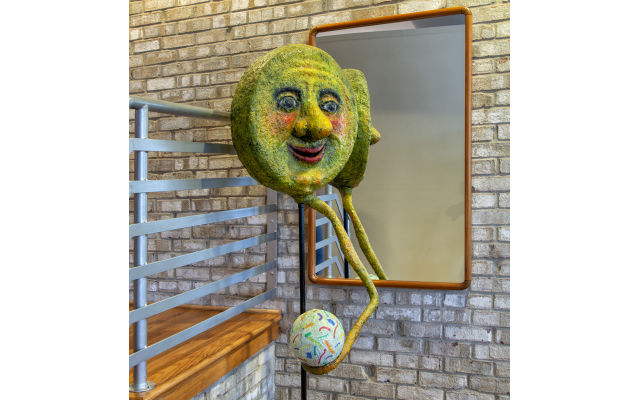 Barr: I carve the extruded polystyrene with a hot knife so it doesn’t crumble, then wrap in plaster cloth (like what’s used to construct an arm cast for a broken bone), then finish with oil paint. It does take a lot of patience in this slow process of pivoting from wet to dry. I have three of these at home. The Greeter, The Ancestor, and Bella, the Italian cook. Jaffe: What’s coming up for you artistically? 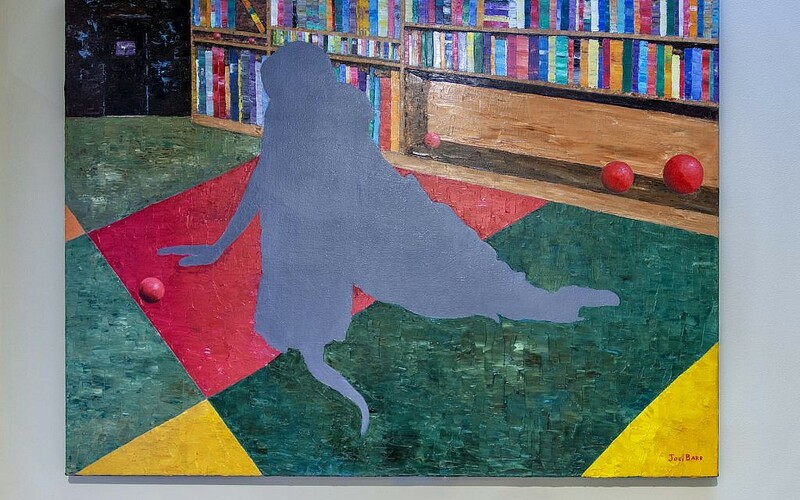 Barr: I have a solo show, WORDS AND STORIES, opening April 11 at the Thomas Gallery in the Quinlan Visual Art Center in Gainesville. I’ve been working towards that, along with doing commission work. Barr’s works are on display at his studio and locally at the I.D.E.A. Gallery and the Aimee Fine Art Gallery as well as in the Newbill Collection in Seaside, Florida. In October, he will be teaching oil painting at Muse Destination Workshops in Lake James, North Carolina.